Don’t Forget Your Mobility Insurance. After watching the BBC documentary “the trouble with mobility scooters” and coming to the conclusion that mobility scooters are generally a good thing. They just need to be used wisely. We still highly recommend that you take out mobility scooter insurance to cover you for any accidents or if you happen to breakdown. As mobility scooters are not classed as vehicles, you can’t get vehicle insurance for them. Not all mobility scooter sellers provide mobility scooter insurance, but we do! Cover starts from as little as £1.53 per week. Our mobility scooter insurance covers both mobility scooters and powerchairs. Fire, Theft and Vandalism – will cover the cost of repairing or replacing your product if it is unfortunately stolen or vandalised. Accidental Damage – full cover against loss or accidental damage whatever the cause. Our insurance company will cover the cost of repairing your product if it is lost or damaged by any accidental cause including fire, storm, theft and vandalism. We offer insurance that can cover you between 1-3 years. It’s your choice! Although mobility insurance is not compulsory yet, the Department of Transport states: ‘Although it is not a legal requirement, an insurance policy is strongly advised.” We therefore recommend that you take out insurance on your wheelchair, mobility scooter or powerchair. For more information click here or call us on 0800 046 3949. Movement is difficult for many disabled people, so it’s not easy to burn calories and stay at a healthy weight. You can stay at a healthy weight by monitoring the food you eat or you can exercise to burn those extra calories. 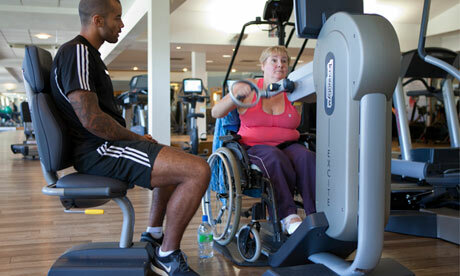 Exercise as a disabled person burns more calories because of the extra effort you have to put into it. You may only be able to manage a few minutes on the treadmill but you’re likely to have burnt as many calories as the non-disabled person that was on there for longer than you. We recommend that you use a heart monitoring device while training as your heart rate will tell you how many calories you are burning. Some of you may be put off by going to the swimming pool as many pools have a hoist not a ramp. Many feel that with a ramp you can discreetly get in and out of a pool while you can’t when using a hoist. When you’re already conscious about your body and getting into a pool full of able bodied users you know that they’re staring and it’s just not very appealing. It puts you off the whole idea. When you’re ready to go for a swim we recommend that you go with a family or friend member for morale support and who can help you with getting in and out of the pool. But it’s not just the staring. Even though public gyms may claim to be accessible, the reality can be different. Gym equipment can appear daunting for the beginner. For example hand-bikes, which are a great cardiovascular workout for paraplegics, the saddle is quite small or when pedalling it can be difficult trying to cling on. However many gyms offer a free session with a personal trainer. You can learn a lot about the gym equipment such as the stepping machine and the gym ball, as well as how to do stretches and twists, which are suitable for you. You may even decide to set up a small gym in your own home! You will feel so much better for it. Here at More Than Mobility we know that not all disabled people are the same and many people may have many more difficulties achieving weight loss/ staying at a healthy weight. Your disability will limit the types of exercises you can do. So that’s where we recommend that monitoring what you eat has to come first. Last night The BBC aired a programme “The Trouble with Mobility Scooters”. Before we even watched the programme we feel the title already set the tone (we expected to see mobility scooter users in somewhat of a negative light). To our surprise the documentary was engaging/ interesting and even touching to watch. There are now around 330,000 mobility scooters users in the UK today and rising. The UK has more mobility scooter users than any other country in Europe. For many mobility scooter users, their scooters are a lifeline offering them some freedom and independence. At the beginning of the documentary we met Hazel who suffers from chronic lung disease and who struggles to walk. She has had a mobility scooter for 5 years. She described having a mobility scooter “It’s my lifeline, I literally go everywhere on it…it’s a life saver for me”. So what’s the trouble then? 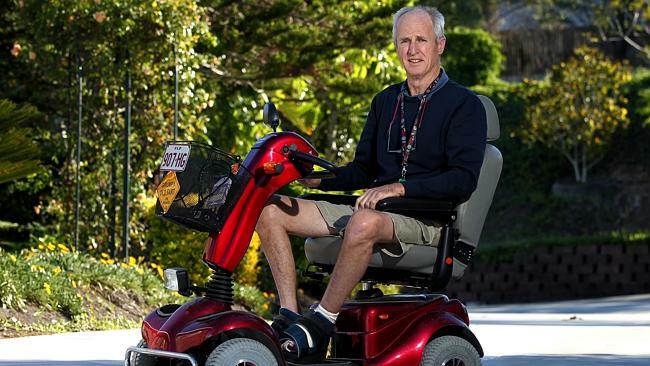 As mobility scooters are classed as a disability aid they’re exempt from the Road Traffic Act, which some road users describe as causing chaos. So to reduce the number of incidents the South Yorkshire Police has set up the mobility scooter driving school called Lifewise. They’re very patient and warm hearted with the scooter users who attend the school (including Hazel). We got the opportunity to see older people live their lives to the fullest with the help of mobility scooters. The conclusion drawn from this documentary is that mobility scooters are generally a good thing. They just need to be used wisely. Also it is important when buying a mobility scooter to ensure you get appropriate training from a reputable dealer such as More Than Mobility. We also highly recommend that you take out mobility scooter insurance to cover you for any accidents. Cover starts from as little as £1.53 per week. If you have been thinking about purchasing a mobility scooter, you will not be disappointed. As Hazel said it will give you freedom and may even become your life line. So shop our mobility scooters today! This Summer get £50 OFF when you spend £500 on mobility products! Simply enter code SUMMER50 when ordering online or when you call 0800 046 3949. Offer ends 31st July 2014. SEE OUR GREAT OFFERS BELOW! Compact road legal mobility scooter with a range up to 26 miles. Portable lightweight electric wheelchair suitable for indoor and outdoor use. £130.00 – LOW VALUE PRICE! Lightweight transit wheelchair that’s practical and easy to transport. Comfortable electric adjustable bed to help getting in and out of bed and to offer a great night’s sleep! Choice of mattress styles. £495.00 – LOW VALUE PRICE! Comfortable electric riser recliner chair to help you get in and out of your chair. Save space with this wallhugger in choice of attractive colours. June is Motor Neurone Disease (MND) Awareness Month. Over at the Motor Neurone Disesase Association, they see the value in raising awareness of this disease as it enables them to back more crucial research into the causes of MND, to help bring a cure closer. Their theme is called VOICE; encouraging people to spread the word for MND sufferers when their voice might be getting fainter. MND affects the motor neurones or nerves, in the brain and spinal cord. This means messages gradually stop reaching muscles, which leads to weakness and wasting leading most sufferers to become registered disabled. A photography exhibition has opened up in Liverpool. 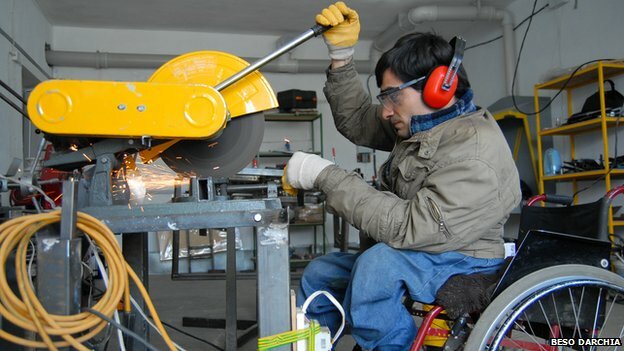 The aim of this exhibition is to dispel the myths about disability and employment. There are large photographs taken in the city and from countries across the world, Working Lives: Here and There shows active disabled people in their places of work. The images have been created to challenge negative myths surrounding disability and employment. Colin McPherson, the photographer who put the show together, says: “I wanted to produce something that looked positive, direct, optimistic and powerful,” and for this the disabled subjects had to be seen working productively, he says. If you live near the exhibition, we recommend you try and get down. This free exhibition will run from 12th Jun 2014 – 25th Jul 2014 and is held at 43 Castle Street, Liverpool. More information can be found here. Older adults could delay the risk of developing a disability and enhance their quality of life by taking a 20 minute walk daily. Reduced mobility (the ability to walk unaided) becomes more common as we age and is a risk factor for illness, disability and hospitalisation. US researchers followed the progress of over 1,600 men and women aged between 70 and 89. All were leading lifestyles with little or no physical activity at the beginning of the study, putting them at an increased risk for mobility-related disability. The participants were randomly assigned to one of two groups and were monitored over the course of two years. The first group took part in a moderate-intensity physical activity programme, while the second group took part in a health education programme that focused on topics related to ageing. The researchers found that the risk of major mobility-related disability fell by around 18% among those who took part in the exercise programme. They were more capable of walking unaided for about a quarter of a mile than those in the other group. Overall, undertaking just a 20-minute walk every day had a beneficial effect. Here at More Than Mobility we would like all elderly people to enjoy independent living and would encourage you to take that 20 minute walk daily. However if you do have mobility issues then see our walking aids and rollator products. This Friday 6th June marks the 70th Anniversary of the D-Day landings in Normandy. The biggest wartime operation ever will be commemorated on both sides of the English Channel. Second World War veterans will be honoured with a commemorative service and wreath laying in Bayeux. There will be a variety of events and you can find information on the British Legion website. Here at More Than Mobility we value all our veterans who went out to war and risked their lives for the freedom of our country. We hope you will join us in celebrating our heroes. Before you know it, it will be Father’s day. So beat the last minute rush and show your Dad or Grandpa how much you care by shopping online today! We have a wide range of products that will be great gifts for your Dad or Grandpa from clothing and mobility products to useful daily living aids. Have a browse online today – we are sure you will find a great gift. Folding walking stick with a grow grip handle to help see in the dark. Stylish wheelchair bag, designed to increase safety. Daily pill boxes each with 4 compartments Identifiable by text and braille. Enjoy exercising while reading or watching the television! Brushed cotton men’s long sleeved night shirt. Unique men’s fleece bed-jacket with easy access sleeves.